.... or at least the other side of our world. I just got back from a week in Beijing, as part of a program for American journalists to share their experience with our Chinese colleagues on reporting on science and the environment. I'd never been to China, nor to anywhere else in Asia, so every part of this was a new experience. China's capital city, lately swelling to a population of nearly 20 million, is basking in the glow of an economic boom - all while sweating in anticipation of its turn in the world's spotlight this August during the Summer Olympic Games. After a few days to hit the obligatory tourist sites, and shake off the inevitable jet lag, we got down to business. The journalists were from several divisions of CCTV, China's massive, state-run national broadcaster. We met documentary producers, staffers from CCTV's English-language network, and from "Greenspace," China's nightly, prime-time environmental news show. Five nights a week in prime time? A potential audience bigger than the population of the United States? Sounds pretty good - in fact, it sounds like a much better deal than a Science and Environment Guy can get here in the West. The message has come down from on high: Green is the new Black in Red China. Of course, it's not that simple: The "on high" is the Central Government, and the Central Government doesn't let you say Bad Things about the Central Government on the Central Government's TV Networks. When I showed a portion of our recent "Broken Government" special on US failures in environmental protection, I was politely told that it would be naive to think that kind of thing could fly in China. In fairness, some of the questions we received sounded a little naive from a Western perspective. (My favorite: "We know China has the world's world pollution problems, but what advice can you give us to turn this into a positive news story?"). Simple answer: Clean it up. Except that there's no such thing as a simple answer. China has at least 20% of the world's population, but only 7% of its fresh water. Much of that is too polluted for human use. Much of the rest is drainage from the snowpack and glaciers of the Himalayas - now in drastic decline due to global warming. China's running out of water. And land. And acceptable air. And it's rapidly caught up to the US in greenhouse gas emissions, with the prospect of huge increases as its economy continues to grow. Importing the rest of the world's waste is a growing revenue stream for China, even while the actual streams often run in pastel colors from factory and mine runoff. Is there any good news here? Maybe. China's time of reckoning with a growing environmental crisis is nicely timed for its coming-out party at the Olympics in August. But will the spirit of the "Green Olympics" survive after the torch goes out? Stay tuned. I don't know when it will be, but someday...China will reach out and slap the USA silly and we won't know what hit us. When a billion people are starving or unable to do whatever it is Chinese people do, they will react and try to take it from the rest of the world. This is what history teaches us. Talk about industrialization run amock! China should be penalized and/or the olympics boycotted for their environmental destruction. So basically China is going to go green for two weeks, and then back to its usual polluting, burn-all-their resources up selves again. HAS ANYONE CHECKED OUT THE BBC DOCUMENTERY THE GREAT GLOBAL WARMING SWINDLE? YOU CAN SEE IT ON UTUBE. ONE OF THE 2 FOUNDERS OF GREEN PEACE IS IN THIS DOCUMENTARY.http://video.google.com/videoplay?docid=4302904746669786959&q=THE+GLOBAL+WARMING+SWINDLE&total=430&start=0&num=10&so=0&type=search&plindex=3 YES WE ARE USING UP OUR RESOURCES, INSTEAD OF USING GREEN TECHNOLOGY WE ALREADY HAVE. BUT IN DOCUMENTS FROM AROUND THE YEAR 1000 SHOWS THAT THE COUNTRY OF GREENLAND WHICH IS NOW COVERED WITH ICE, WAS FARMED. Mike, your statement has nothing to do with this article. You have simply tied your own bias and speculative belief of China to an issue that needn't go there. This is an article about environmentalism in China, and an informative one at that. I said 10 years ago that we need to have a "man on the moon" mindset regarding our energy problems. We have at least three reasons to tackle our energy problems. 1) doing what we can to address the problem of global warming; 2) freeing ourselves from dependence on Middle East oil; 3) unleashing our technological and scientific energies on the problem of creating renewable sources of energy to replace inevitably disappearing oil resources. I wish I had a taller soap box. 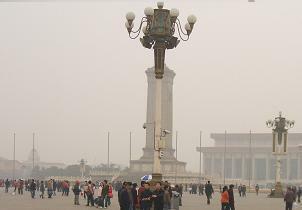 It is interesting to note the concern of smog in Beijing for summer Olympic games. I wonder why the inversions and dirty air in Salt Lake City, Utah were never mentioned during and prior to the 2002 Winter Olympics! Salt Lake has some of the dirtiest air in the US! 1) Salt Lake had the WINTER Olympics.... pollution problems always get compounded in the warm weather of summer, particularly when vehicle exhausts get catalyzed by warm weather to create a problem with ground-level ozone. Beijing is now totally car-happy - still lots of bicycles, but literally millions of people who are newly-minted car owners. So add up the following: August's hot weather, a million Olympic tourists, and an increasingly affluent metropolis of 20 million, all sitting in traffic. 2) Salt Lake's historically biggest pollution problem has come from the copper smelter that's just west of the city, and Salt Lake Airport. The Kennecott Smelter has often been the object of criticism - its emissions tend to drift toward downtown, then get trapped behind the mountains east of SLC. But according to EPA numbers, they've cleaned up considerably in the last 20 years. They're also subject to the ups and downs of the worldwide copper market, which had a tough time in the late 90's and early 2000's (including during the 2002 Winter Olympics). They operated - and polluted - less often then, but the copper market's coming back these days, due to our worldwide mania for electronic gadgets with copper wires in them. 3) Air quality problems would surely have been less in downtown SLC in 2002, but far less so on the slopes and bobsled runs several thousand feet higher in the mountains. Bottom line: With all due respect, Salt Lake City ain't no Beijing, and it certainly wasn't back in the winter of 2002. Picabo Street didn't need to claim her Gold Medal in a surgical mask six years ago. Distance runners in Beijing may have bigger concerns. Hi Peter; Since I live in this area I am possibly more in tune with issues for this area. Fine particulates are the major pollution problem in this area and come from other sources currently than just the copper mining. People are exposed to these pollutants as they go to any events in Salt Lake City including airport travel, not just mountain skiing as you allude. Our local weather reports constantly have yellow and red pollution warnings for Salt Lake City in the winter about air inversion and pollution which affect many people. Thanks for your viewpoint . I heard that BMW is going to make a hydrogen powered car!! Cool!! James Hendrickson, the reason that pollution is such a big issue for these games is Beijing is REALLY polluted! I went there in fall of 2000. Imagine the worst smog you've ever seen in L.A./Houston/New York , multiply it by 10 and add a volcano for good measure and you will start to get an idea of how bad the air is. The pollution is simply unbelievable. Did I hear right that living in Beijing is the equivalent of smoking two packs of cigarettes a day? I think Hong Kong would have been a better choice. Is it fair that american workers are displaced becasue China allows pollution to produce cheap goods. Why not impose the same standards on China as the U.S. requires on its factories to level the field? "20% of the world's pollution" ! They will hasten our demise as a civilaztion that much faster. Last summer I was in China on business and was impressed on many levels. The pollution was something i could have never imagined. Standing on the ground and looking up at a thirty story building and watching it vanish into the smog was shocking. Taking off on all my flights was highlighted every time in multiple citys by counting to three before the ground was no longer visible. There are twenty year olds in Bejing that have NEVER seen the sun and never will. You can`t even see a glowing spot of sun on a "clear " day. The rivers are yellow in tinge with splotches of purple and blue floating by. Thirty miles outside of Bejing we elected to see the Great Wall. In both directions the wall disapeared within just a few hundred meters. W e were told that to see sunshine it is at least a three hour flight west. I could go on and on. My throat still hurts. One might say, why would anyone want to live in so much filth and pollution? But then you realize, Beijing is the old capital city of China, steeped in tradition and history, and most of all, this is where the jobs are. Counter-point, then why don't they move to another city? Detroit, Michigan is a comparitive example of air and water pollution out of control. Detroit has lost much of it's population due to crime, pollution, and a faltering economy. I was in Detroit last year for a funeral, and shocked at what I saw. With the one-child policy China has, and maybe the general disgust of living in filth, Beijing citizens will start to flee to other Chinese cities, and Beijing may see the sun again.